This month, we exhibited at the Landscape Show at Battersea Park for the 7th year – a great show that we all really enjoy. It’s great to meet up with existing customers, meet new businesses and network with the other exhibitors. We would like to say a massive thank you every visitor we had to our outdoor lighting stand – we will be in touch very soon, if not already. Every year we have built our own stands which is extremely hard work for our team. Previously our outdoor lights were often displayed on generic stands, however year on year we have made more improvements, evolving the stand into to a more in-situ setting, which is more beneficial to those who are seeking outdoor lighting inspiration. We, as a Company, have learnt that garden lighting can be a bit of a grey area for some garden designers, many of whom may have never incorporated this into their designs. Lighting is now a huge factor in garden design with the concept of an “Outdoor Room” being of paramount importance. Incorporating the correct lighting will really enhance different areas and totally transform the garden once darkness falls. We therefore strive to educate our customers about the different types of lighting available, demonstrating the different effects that lights create rather than simply showcasing their general appearance. Hence, our new stand design built by Craig Taylor! Craig started working at Lumena Lights just over a year ago as a warehouse operative. Day-to-day he assists Jane with picking and packing, undertakes stock modifications, product testing and is well known for ensuring the warehouse is kept neat and tidy. This year, Craig took on a new task, his first full stand build for the Landscape Show, and we think he did an amazing job. He worked closely with the rest of the Lumena Team to come up with a stand design, which would show our garden lights situated in their usual surroundings and used for specific applications. For example, the Charleston Cobra Spread lights were installed either side of the path to demonstrate what a perfect product they are for illuminating path ways with no glare, spreading light around the immediate area surrounding the fitting. Path Lights come in many shapes and forms, by way of bollard lights and in ground lights but spread lights are often overlooked (although in our opinion they are one of the best options). Craig worked for many weeks, building a decking platform to enable path lights and other garden lighting to be mounted in the correct position, concealing all cables. The majority of the fittings were installed as low voltage, 12v garden lighting, although many of these fittings are also available in mains 240v. According to Craig, “building the stand was hard work, I’m absolutely shattered, but it was well worth it, and I am really proud of what I achieved”. Craig created different areas of the garden including a seating area, grass, raised flower beds, water features and statues. Relevant garden lights were carefully selected to illuminate and enhance those areas with various Spike Lights, Parflood Flood Lights, Garden Hanging Lights, Rock Lights and more. Craig also had an idea to box in the gazebo legs which he felt ruined the overall appearance of the stand. Painted brown, these looked similar to Pergola beams, the perfect platform for outdoor wall lights. For the first time at an exhibition, we were able to display a selection of our outdoor wall lights, our Fisherman, adjustable Smartspot and twin Hilospot. Our visitors responded extremely positively to this arrangement, showing more interest than ever before – a great bit of inspiration by Craig. 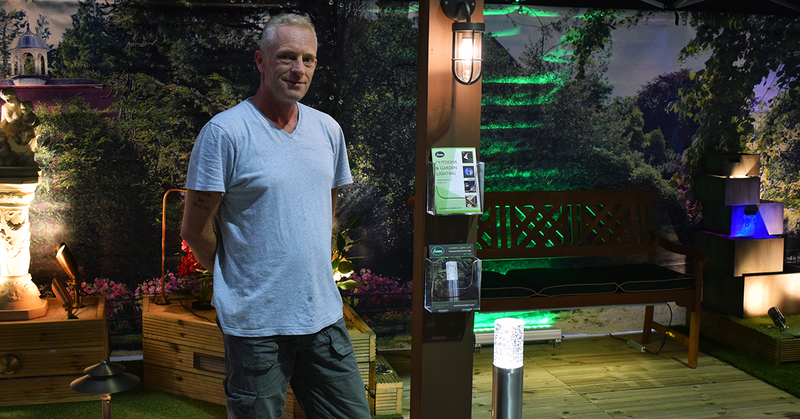 With a lot of hard work over many weeks, Craig transformed our trusty gazebos and decking platform into a beautiful garden setting which showcased the different types of lighting available from Lumena Lights and how they can be incorporated into a garden effectively. With the Holiday Park Show fast approaching, it’s now back to the drawing board for Craig to come up with a new stand design more relevant to a Holiday Park Setting. Good Luck Craig – we can’t wait to see what you come up with!